News 8/02/07 This project is officially on hold for the second time. Developer Lorenzo Doumani announced that the Conrad/Waldorf=Astoria project is on hold again. He claims there will be an announcement in October 2007 but offered no details. 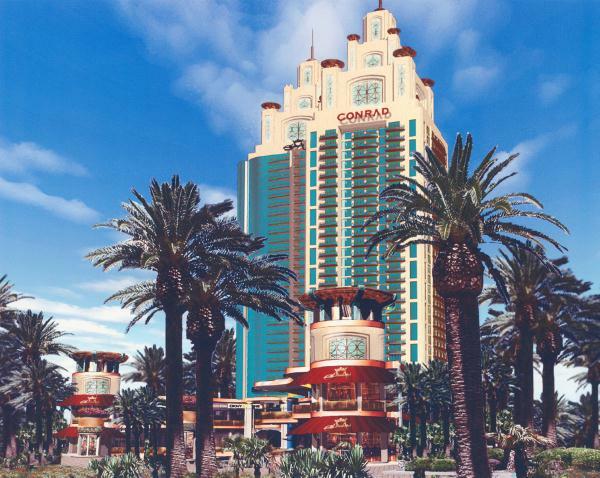 The Conrad Las Vegas, an $825-million, 60-story hotel designed by Paul Steelman Design Group, will be located on the Strip due-south of the Riviera on a narrow piece of land that formally housed the La Concha Motel. The hotel will feature 216, 5-star-hotel units on floors 11 through 20 and 696 luxury condominium-hotel units on floors 21 through 49. Hilton Hotels will manage all Conrad residences. Their amenities and floor plans will be released in November 2006. The building will feature five restaurants, a 27,000-sq.ft. spa and fitness center, a private owners club, more than two acres of pools and cabanas, and several boutiques. The project is scheduled to break ground in April of 2007 with completion in 2009. The Waldorf=Astoria (that's not a typo) Residences are 76 luxury condominium units which will be located on the top 10 floors of Conrad Las Vegas. Due to strong demand for this project and its being a boutique property with a very limited number of units, The Waldorf =Astoria Residences will be Priced from $2.8 to $10 million equipped with European cabinets, granite countertops in kitchens, stone countertops in bathrooms, 10-ft. ceilings with recessed lighting, glass perimeter walls, private balconies, and fireplaces. View the progression of bracing each arch, cutting them into sections and loading them onto a truck to be transported to a holding area. The pieces are being stored in the neon graveyard downtown where they are awaiting restoration and reassembly. The shell will be the new lobby for the Neon Museum. The tent like temporary building behind the shell was added a few years back when La Concha was used as an Electric-Car rental facility. The photographs in the gallery were taken by Allen Sandquist December 18-23/2006. 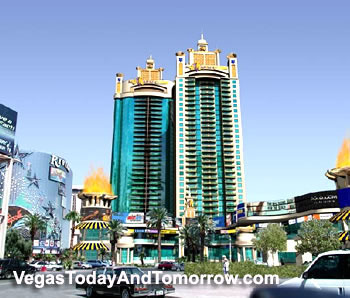 2/15/2006 La Concha Motel (which lived on the strip across from the Stardust since 1961) has been leveled to make room for the Conrad Las Vegas and Waldorf Astoria Residences. The original lobby structure (which resembles a conch shell) remains. The curators of the new Neon Museum (being created north of downtown) will have the shell building moved to the museum site and use it as their welcome center after a restoration. 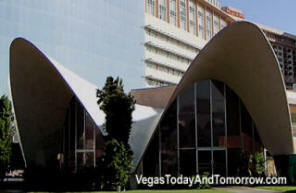 The shell-like structure was designed in 1961 by Paul Revere Williams, one of the first African-American architects to design buildings in Las Vegas and is a prime example of "googie" architecture. Generous contributors and activists have raised the needed $500,000 to move it. There is a website dedicated to saving this historic landmark. You can see many vintage photos and make donations there. The Neon Museum website also has info. First, they were going to have two towers. Then, the plans changed to combining everything in one tower. Then, the project went on hold. In September 2005 the hold was lifted and the plans were altered back to the original two-tower design. Now (January 2006) The Conrad/Majestic folks have unveiled a spiffy remodel of the one tower plan. And I must say "it's a nice looking building. The rounded corners on the original 'one tower' design have given way to square corners in order to reduce building costs. 9/23/05 It's back on, the hold (reported below) has been lifted. The folks at Hilton have done some math homework and figured if they build both towers at the same time they can save enough money to justify actually moving forward with the project. The original plans were for two towers (one for the Conrad Hotel and the other for the Majestic condo-hotel. 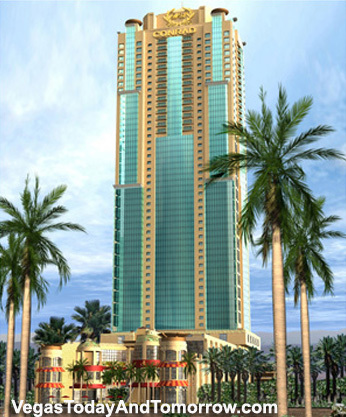 That plan was scaled back to one tower for both the Conrad and the Majestic (as shown below) and a possible second tower later. Then the whole thing was put on hold. This is an older rendering from the original plan and will be updated when the new plans are released in October. 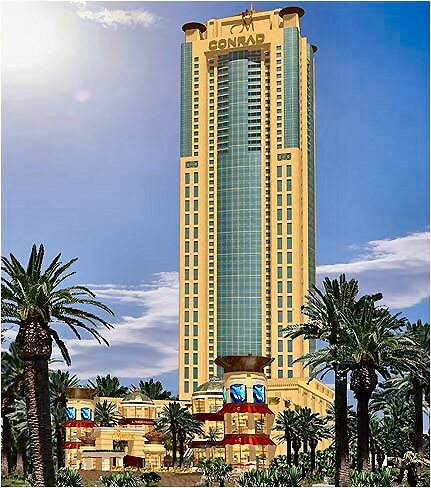 Bruce Hiatt, broker and owner of Luxury Realty Group in Las Vegas, said, "developer Lorenzo Doumani stopped all sales on the Conrad Majestic project because of rising construction costs". The developers went through several contractors, coming in with very high bids. They felt there's a greed factor going on right now and think if they sell any more units now, they'll be under pricing themselves. They're not going to raise prices for those locked in, so anyone in there, already made money. This is the 3rd Conrad hotel in the US and the only ongoing high level Hilton licensed hotel in Las Vegas. This will be a strong player on the Strip. 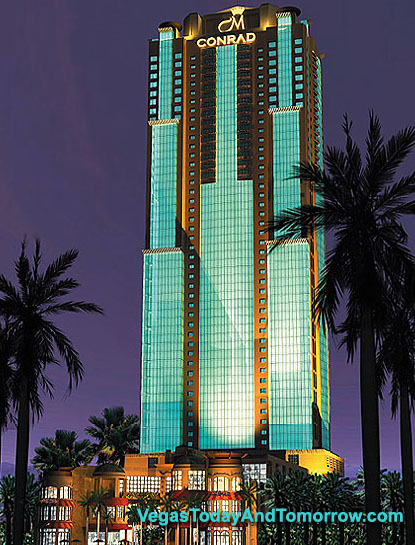 Conrad is the highest level for Hilton and is considered by many to be higher than Ritz Carlton. Conrad will consist of two types of condo-hotel suites for sale. Regular condo-hotel suites and super-suites. The super-suites will be on the upper floors and all two-bedrooms. All of the condo-hotel units will be fully furnished and participate in the hotel rental program where the owner participates in revenue.